Mul kimchi literally translates into water kimchi and it's something that is enjoyed by Koreans especially during the hot summer season. 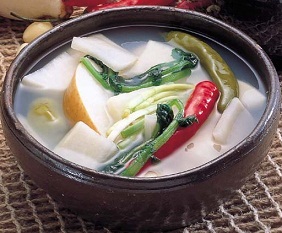 The basic difference of mul kimchi and other types of kimchi is that water kimchi is served in vinegary brine which lacks the traditional red color associated with typical Korean kimchi. Additionally, it lacks the traditional spiciness that usually accompanies majority of different variation of kimchi. Mul kimchi may be an ideal type of kimchi to try for first timers who may find regular kimchi too spicy, strong and salty in taste. It definitely has less salty flavors yet still crunchy and refreshing, packed with garlic and tangy taste to each bite. Vegetable content may vary but napa cabbage (white portion only), radish, onion, red & green peppers, and green onions are usually found immersed in its vinegar-based water. For slight maturation, fresh made mul kimchi is stored in room temperature for 1-2 days and served chilled thereafter for optimal taste. It's a very satisfying side dish with a cooling taste that can offset some of the spiciness found in Korean foods.